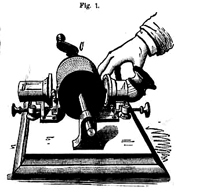 I’ll be recording a voice from the audience on wax, using an original Edison phonograph. I’ll also be discussing the Victorian obsession with capturing the voices of the dead, in the earliest days of sound recording. For The Voice, an evening event at the Wellcome Collection, London. There are several talks and demonstrations across the evening and admission is free.